I'm back in Quito, and off on the birding trip tomorrow. I want to thank you personally for all the organisation and support. Also thanks to Raoul and Fernando who took me around Puerto Ayora on Day 1 to find a Western Union agent with internet and enough cash to get me financial again. Then took me all over Santa Cruz. Day 2 & 3, David Ascencio, mi tochia, was fantastic as a guide, knows the birds and everything on the other islands. Inry picked me up last day and was a great guide also, took the time to show me an owl on the way to the airport. Lastly, a special testimonial to the Sanchez family at Hotel Portal de Cantuna in Quito, to lend $200 to a stranger is beyond any kindness I have ever received. And the hotel is a fantastic touch of old Quito, most highly recommended to any clients looking for somthing memorable in Ecuador. Otra vez, gracias y vaya con dios. Thank you, thank you, thank you. We had an amazing trip. You could not have planned this any better nor had the staff more attentive, guides were friendly and very knowledgeable and the hotels were very nice. Swissotel was the best. The Hathaway's became ill a couple of days after we got there and the hotel staff arranged for a doctor to come to their room and look after them. Everything ran like clock work. We were met on time at every part of the trip regardless of our arrival time. We would not have been able to plan such a trip on our own. I will gladly give your name and contact to anyone I know planning a trip to either the Galapagos or Machu Picchu. Your planning was outstanding. Also, the Travel Group in Peru were amazing. John Hathaway in our party had his wallet fall out of his pocket at the hotel in Lima. We notified the hotel, they located the wallet and Daniela from the Travel Group met us at Lima airport on our return flight to give John his wallet, then went the extra mile and arranged for us to go to Museo Larco for the afternoon and the taxi to come back and pick us up, instead of sitting in the airport all afternoon. Our flights didn't leave until after midnight so it would have been a long wait. Thank you doesn't seem enough. I would appreciate it if you forward this to your supervisor. I would like them to know what an outstanding job you did for us. Hello Veronica, and thank you for following up. I am delighted to give feedback! Kylee and I had an amazing trip and it was put together very well for us, thank you! The airport transfers worked out perfectly and we had a nice tour of the Charles Darwin center. Hotel Ikala was simply fantastic! We loved the room and the staff was very nice and helpful. I would absolutely recommend this hotel! For the boat tours we had Anita helping us each day and she was very nice. The staff on the Altamar was also excellent! Each island offered different vegetation and animals, and the snorkeling was amazing with clear blue waters on 2 of the 3 days (one day was rainy and windy). Bartolome was our favorite island. Santa Fe was our last day and it was the best day of snorkeling. We saw some small sharks and actually swam with 3 sea lions! The day tour of Santa Cruz started at the Highlands (great views of Santa Cruz) and the Sink Hole (wished we could have hiked down to the bottom). Garrapatero Beach was very pretty and the Lava Tunnel was very interesting; we had never seen anything like it! We ended with lunch at the tortoise farm and then got back early so Kylee and I could venture off to Tortuga Bay. We rented a kayak there and had a nice couple hours on the beach; well worth the walk from Puerto Ayora. The town of Puerto Ayora is so very nice! Very easy to walk around and very safe as well. So many restaurants to choose from and we tried a different one each night. Went to KF Williams one night and all of those places on that busy dinner street we so cool! Found a great place for sushi one night as well. Kylee had a manicure/pedicure at a spa one night before dinner at Almar, which was fantastic. After dinner most nights we ended up at the Bongo Bar and became friends with the manager, Ignacio. Overall this was quite the adventurous trip and I would highly recommend GalapagosIslands.com to my friends and family. Thank you for all of your help to make this an amazing trip for me and Kylee! You turned what was a potential disaster (and we were all pretty sure it was) into a great trip. We had a wonderful time on the islands. Your redefined planning was great. We feel as if we saw most of everything on the islands we visited. All the guides and hotels were fabulous. I am much aware that it took a lot of effort on your part to pull that together. 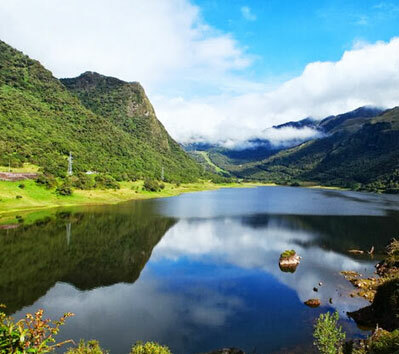 We even had great adventures in Mindo & Otavalo, which otherwise we would have missed. I will highly recommended your company and especially you to all the people who ask about our trip. I can’t say enough about how helpful you were. I would like to thank you so much for making Monica’s and my trip to Galápagos and Quito/Mindo such a nice and wonderful experience for life. It wouldn’t have happened without your help - thank you so much! 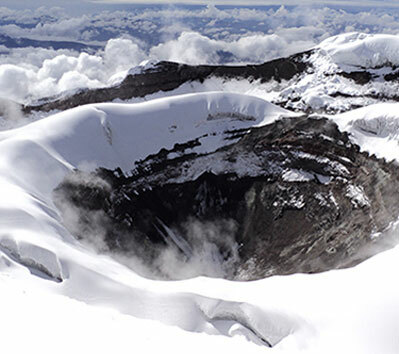 I will recommend you to everybody going to Ecuador/Galápagos - 5 STARS! We are just back at the Hotel in Quito and have had a wonderful dinner- it was exquisite. We wanted to congratulate you and your services on an excellent trip- we have had the best time and felt that we have had 100% attention with all guides and transfers and it has surpassed our expectations. Thank you so much from Julie. We will highly recommend your services to those wanting to travel to Galapogos. Our only recommendation that we decided to do, as we all love lobster, was to eat out each night. This gave us a good feel for the town which we loved as well. As a point- Maybe give that as an option to guests. We felt if we ate at the Hotel we would stay there and not explore as the days were full and tiring, but wonderful. We enjoyed drinks at the bar most days - Caiparinas were our favourites. Many thanks once again. We loved all your staff and could not fault them. Attention to detail always.. Superb- excellent. I just wanted to tell you what a terrific time we had on our vacation. It was very organized and we felt we were in good hands. We have finished our trip in Ecuador today. Thank you very much for your assistance in trip planning and your advice so far. The arrangements were terrific and your staff are so knowledgeble and helpful. We have a very good experience in Ecuador and for sure we will come again in the future. 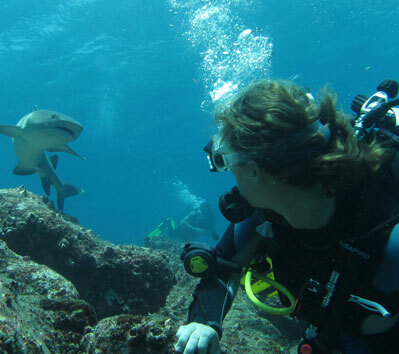 Had a fantastic week in Galapagos, Iguana scuba was an excellent team and the dive locations were varied and fantastic. Day tours gave me a chance to venture onto the islands that I saw on the boat and explore them thoroughly. Food was also great and the last day was such a wonderful finish. Thank you for all your work in making the trip a reality. We have just arrived back from our holiday spending six days in the Galapagos islands and touring Quito. I would like to thank you for providing us with an incredible holiday. We thought the planning of our itinerary was perfect and couldn't think of any way it could have been improved. Our guides (Julie and Santiago) gave us great personal service while providing lots of extra info and attending to all our needs. Also the tour guides were excellent. We enjoyed our holiday so much that we are planning on returning to the islands sometime in the future . Well done, we are certainly pleased we chose to book our holiday with you. I just wanted to let you know we had a wonderful trip. Thank you very much. With the exception of the speed boat back to Santa Cruz from Isabela everything went very smoothly. I can't wait to visit again in a few years. If we visit again, I'm sure that we can visit different islands. Thank you again for your help in planning our wonderful trip. We've just returned back home to Moscow, from our long honeymoon. We had time to reflect on our honeymoon and came to the conclusion that we were very happy with your services, wanted to reach out, thank you once more explicitly. The whole trip was perfectly arranged, timing was great, all the logistics in between worked very well – we had the great feeling of being taken care of. 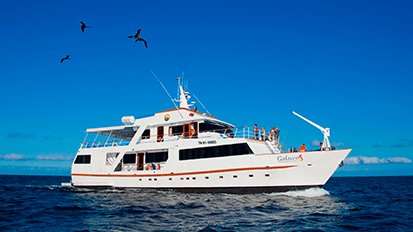 The Galapagos Islands were the highlight of our four weeks honeymoon, for sure – we will come back at some point, would love to rely on your services then again. All the best & many thanks again! Thank you very much for all your work regarding our Galapagos cruise booking. The trip was awesome, we enjoyed every moment, everything was perfect. If we ever decide to visit Galapagos again, we will use your agency. And of course - we will recommend your services to all our friends. El viaje en el Natural Paradise fue absolutamente perfecto. El barco es fantástico y muy cómodo, la comida deliciosa, el personal tremendamente amable, la guía Malena preparadísima y encantadora, y las visitas a las islas enormemente interesantes. As I am back from vacation this morning, I just wanted to thank you very much for your prompt follow up and perfect organization of our vacation in the Galapagos . The service on the Majestic, was really first class, everyone on board was always ready to please us, always a smile on their face, the guide "James" very knowledgeable and fun to be with, the quality of food and beverage was more than acceptable on such a short boat .we cannot wait to come back as four days was way too short. 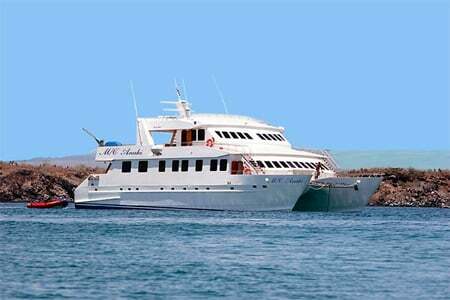 I will recommend strongly your company to however is interested to go to the Galapagos. And as you can see below, service is my business. The cruise was fabulous! I loved to activities, the crew and guides were very knowledgable and helpful. Wish I booked longer! We just finished the cruise and it was fantastic! Thank you so much for all of your help in planning this vacation. It was a trip of a life time. Perdón que no contesté tu mail. Recien llego a Buenos Aires, y el celular no me funcionó con ninguna red en Ecuador, por lo cual no pude chequear los mails. Quiero darte las gracias una vez mas por tu atencián. El viaje fue excelente, asi como también lo fue el Crucero. Excelente atención de los tripulantes, y muy buen conocimiento del guia, super recomendable. Everything with the itinerary was straightened out and we had a very special time in The Galapagos! Every guide assigned to us was intelligent,engaging, & personable. The hotel was quite comfortable, well located to the town, and the people were accommodating. The Galapagos is truly amazing! Thanks for your help arranging our tours and stay! We arrived home Saturday late afternoon and are still recovering from the whirl-wind tour. Anyway, we had an excellent time. All of the plans you made for us worked exactly as expected. All pick-ups and drop-offs were on-time; all tour guides were excellent, and the tours themselves were wonderful. I don't think Troy or I would change a thing in regards to our itinerary. We especially liked Sacha Lodge and the program that they put together. This tour exceeded our expectations in many, many ways. Our tour guide was awesome (Jorge), the food was wonderful, the itinerary that they put together for us was excellent. If we are ever in the area again we will definitely go back to Sasha. Thank you very much for putting together a wonderful trip for us and we will definitely recommend you and your company to our friends. We’re back from our Galapagos trip and I just wanted to send you a quick email and let me know how great it was. Thanks you very much for putting such a great trip together for us!! Everything worked out really well, the tour guides were all very friendly and knowledgeable and we had a very pleasant time all in all!!! Thanks again. The trip was amazing, the Majestic boat and the crew were perfect. The room was comfortable and the food great. Our guide Billy did a great job! And all the others too! We had have a wondeful time on board, nice snorkeling trips, brid watching and beach time! Thank you for recommending the Majestic! We would like to report that our Galapagos trip was awesome. Everything went as stated in the written itinerary, our guides were wonderful, there was always someone to meet us and direct us. In addition our accommodations were lovely and well situated.The tours were great too. Thank you for your planning and arranging. We would definitely recommend your travel services to others. Thanks again for helping us make an exceptional family trip!!! I wanted to thank you for all your hard work on our behalf. We had a wonderful time in Ecuador and Peru and really enjoyed all the activities and arrangements. The boat was fantastic with a great crew and Billy was an excellent guide. All the people we met .... drivers, guides, airport pick up and drop off were friendly, helpful, and professional. The hotels were magnificent ( especially Palacio Nazarenas ) and the staff could not do enough to make sure we were happy with everything. It really was a trip of a lifetime and we all have memories that will last for years. As I said earlier, the trip far exceeded our expectations and we are most appreciative. Our stay in Ecuador came to the end. We are waiting for our plane in the airport. I would like to say you Thanks a lot for the wonderful journey you organize for us. We felt it love in your country. It is really a nice land. Thanks again for all your tips and your help organizing. It's been a magnificent few days here and we enjoyed every single tour, we loved every guide and we appreciate the entire program we put together. Certainly it's a magical place to begin with but I am glad we went through you to have these experiences planned out. We appreciate your help a lot!!! I want to sincerely thank you and your staff for putting together such a wonderful trip for me! I thoroughly enjoyed my trip and the beauty and uniqueness of the Galapagos Islands. Everything went well and all your guides were professional and knowledgeable. I liked my hotels as well. I've already been raving about the trip and your company to friends and family! I'm in Quito for a week on invitation and staying at the JW Marriott. Thanks to your patience and arrangement, I had a wonderful experience in my Galapagos Island land based tour. I was a little worried initially but that went away the moment i met your rep at the airport. Everything went smoothly per the itinerary. Special thanks to my main tour guide, Erika Jaramillo, who was very knowledgeable and patience. I hope to bring my family to South America and Galapagos Islands for vacation in the near future and will recommend Galapagos Travel Center to my friends who are planning to Galapagos soon. We are now back from our Galapagos Trip and wanted to inform you, that we had a great time! The guide and the crew gave their best, the boat was great and we had a wonderful time. We can only recommend this tour! With regards to the services you have provided, everything was very OK. All on time and as per schedule. The trip was also very interesting. The Seaman was rocking a lot and my wife was seasick as well as various in the boat, but that is very little anyone could do about it. Thanks for your help planning our trip to the Galapagos. Everything was perfect. We loved the Hotel Plaza Grande in Quito, and the Majestic was a wonderful ship. All of the connections and transfers went smoothly. Thanks for the great organization, everything went well. Now we have a crisis in the country as soon as Russian ruble stabilized, we will return to the Galapagos Islands. We just returned home from our wonderful vacation in the Galapagos. We wanted to give a BIG thank you (gracias) to the entire crew aboard the Grand Odyssey - Dominica. They took excellent care of us and made our travels safe & comfortable. We certainly would recommend the services of your agency as well as the cruise we took. I just wanted to let you know that the cruise in Galapagos was amazing. I want to thank you very very much for all the work you did for us. It was a pleasure to book with you! A quick note to say how much we enjoyed our time in The Galapagos. A place of such magic. The Fragata was a great boat with a crew that looked after us very well. Our naturalist, Myra, was also superb. So thank you for the time and effort you put in to ensuring we had a wonderful experience. Thanks again for everything. The trip to the Galapagos was perfect! That glitch with our missed connection in Miami was a bit stressful, but the concierge at the Hilton handled all the details of retrieving our luggage from the airport when it finally arrived on Friday night around midnight. The Reina Sylvia and it's crew were wonderful hosts, and our guide, Patricia, was very knowledgable and passionate about the islands. We even managed to squeeze in a 3 hour city tour of Guayaquil when we returned. All the drivers and agents that took us to and from the airport were very kind and helpful. So once again, thank you and all the others involved. We are back from our trip which was absolutely fantastic I can't believe we've done it. We had a lovely time and experienced some amazing things on our trip. Thank you so much for all your efforts in booking our dream trip everything went according g to plan and the whole experience was really good. 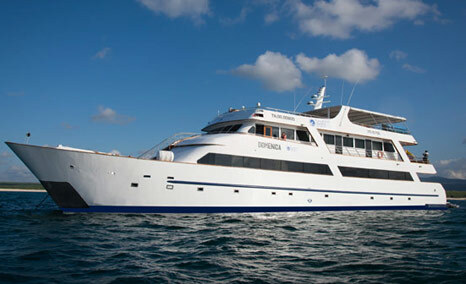 Just wanted you to know what a great adventure we had on our Galapagos trip 28 April - May 5 on the Majestic. We couldn't have been more pleased and I want you to know how much I appreciate working with you over the many months of planning. It was definitely the trip of a lifetime. Thanks for all you did. I would just like to say thankyou for all your help with organizing our wonderful holiday. It was out of this world. I would thoroughly recommend all the places we stayed. The tour guides were excellent. Inca Trail - the Enigma group and Edgar were the best. Obviously the scenery was stunning but the itinerary they did was far better than the others in that we set off earlier and walked longer on the first day - in essence we were on our own and didn't see the hordes of other walkers. Food was lovely - couldn't believe the standard! Napo wildlife Centre- was a stunning location, loved every minute. Again great food. We also loved Quito and Lima and the Galapagos hotel- a shame the holiday had to end. I have already mentioned you to a friend who is looking to go next year. We are now back in Sweden, tired but very happy with our trip. All expectations were met by a wide margin, and it was great to be pampered from landing in Quito to his departure from Lima. A very big thank you to you and your colleagues in Ecuador and Peru. Thanks also for the nice weather, even though it is the rainy season, we had no interference from above. I thought you might like to know how we liked the island-hopping trip to Galapagos that you arranged for me. Here are my thoughts. The hotels were excellent - large clean comfortable rooms, friendly and courteous staff, great locations. The guides were very pleasant company, always on time, and they gave us a lot of very good information, and helped us a lot with finding wildlife and fish. The meals you arranged were very good, and there was always enough food. And we really enjoyed the activities you chose for us. So I think you arranged our vacation very well, and we really enjoyed it. If family and friends ask me about your service, I will tell them that you are trustworthy and reliable. I will only add that, when they reach the Islands, they should always ask their guides to confirm the plans shown on the voucher, and they should bring their own mask and snorkel. Hi Peter! I hope all is well with you and I want to say that my week in the Galapagos has been simply wonderful. I am super happy with everything.